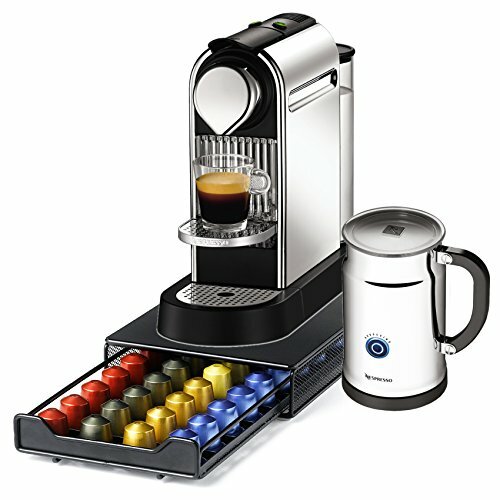 Nespresso Citiz C111 Chrome Single Serve Espresso Machine and Aeroccino Bundle and Bonus 40 Capsule Storage Drawer by Nespresso at Jakis Cafe. MPN: 587282-A+C111-US-CHNE1. Hurry! Limited time offer. Offer valid only while supplies last. Indulge in a rich cup of coffee, house style lungo, or espresso with this Nespresso Citiz automatic espresso maker and Aeroccino Plus bundle. Indulge in a rich cup of coffee, house style lungo, or espresso with this Nespresso Citiz automatic espresso maker and Aeroccino Plus bundle. Designed to brew with Nespresso capsules, this machine has a unique extraction system that offers perfect coffee every time, right from home. Boasting a powerful 19-bar pump to extract all the aromas and give body to your espresso, this machine heats to optimal brewing temperature in just 25 seconds. It is also 40 percent more energy efficient than previous models, featuring an automatic energy savings mode that automatically shuts off after nine minutes and is programmable for up to 30 minutes, eliminating the need for an on/off switch to add to the sleek look. It has a removable one liter water tank, removable drip tray with a folding cup shelf that accommodates tall recipe glasses, and a used capsule container which can hold up to 10 used capsules. With its Thermoblock heating element, 1260 watts of power and two size settings, it also offers a semi-automatic descaling procedure. The perfect companion for the Nespresso espresso maker, the Aeroccino automatic milk frother will create light, creamy milk froth quietly and quickly. It detaches from its base to allow for easy, cordless use and features a handle for convenient serving when entertaining. The Aeroccino will shut off automatically when the frothing is complete, and includes two whisk attachments. Even better, it stores neatly and easily with its one meter retractable cord storage. This single serve brewer is a must for any coffee lover, combining taste and convenience that is perfect for any lifestyle. As an added bonus, you will receive a Nifty capsule storage drawer.